Lazer Team, released by Manga Entertainment, hits the musicMagpie Store on the 15th August 2016. Here are five reasons to check it out! 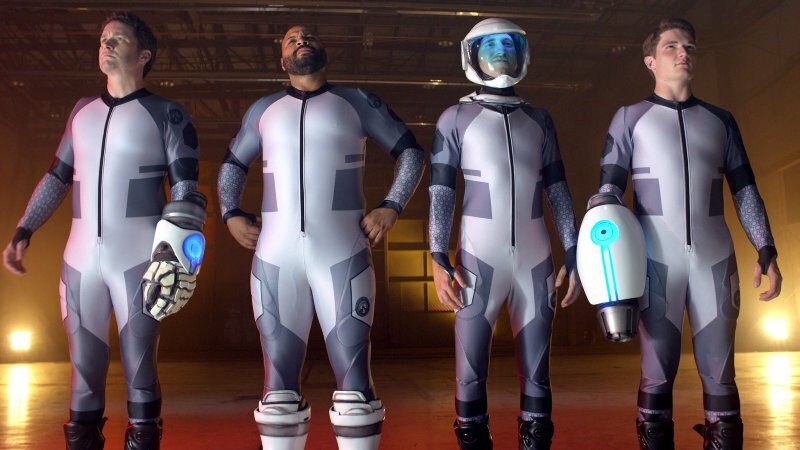 Lazer Team is a comedic take on sci-fi and superhero movies, posing the question: what would happen if 4 idiots got their hands on extra-terrestrial technology that gave them superpowers? Lazer Team kicks off in the 70s, when the human race receives a coded message from a friendly alien race warning that we’re going to be attacked by not-so-friendly aliens. They promise to send some sweet super-powered armour, which a specially trained Champion of the Earth should wear to protect humanity. 38 years later, the armour finally arrives ready for the Champion, who has been trained from birth, to wear… only for four small town fools to shoot down the delivery craft with fireworks. Each part of the suit attaches to each of the men, including the town sherriff (played by Rooster Teeth founder Burnie Burns), a resentful ex-high school football player (Colton Dunn), a high school smart mouth (Michael Jones) and the local idiot (Gavin Free). If you haven’t heard of Rooster Teeth, you may have heard of Red vs. Blue, the web series created using footage from Halo overdubbed with hilarious, foul-mouthed commentary. First released in 2003, Red vs. Blue is now into its 15th season and is the longest running web series ever made. Red vs. Blue is just one small part of the Rooster Teeth empire though. Other hit shows include Achievement Hunter (which Lazer Team stars Michael Jones and Gavin Free both appear in) and Million Dollars, But…, in which members of the team come up with awkward, hilarious and borderline offensive scenarios that other members have to partake in to ‘get’ a million dollars. That honour belongs to Lazer Team, which raised over $2.4 million on Indiegogo. Rooster Teeth initially asked for $650,000, which they received within 11 hours, and reached $1.6 million within 2 days. That makes it the second most funded movie on Indiegogo, although it was the highest for a while (until Super Troopers 2 usurped it). It’s the third most funded film in history too, just behind Super Troopers 2 and the Zach Braff movie Wish I Was Here. It’s no surprise, considering Rooster Teeth has one of the most loyal followings on the internet; their website has over 1.7 million registered users, while the Rooster Teeth YouTube channel has over 8 million subscribers. Although Rooster Teeth is hardly a little-known start-up, the fact they managed to get a movie funded, filmed and distributed to cinemas is a testament to their loyal following, and could pave the way for smaller, independent filmmakers to get their work out to wider audiences. And that can only be a good thing. You can pre-order Lazer Team on DVD and Blu-Ray right now from the musicMagpie Store; both formats contain a special director’s cut never seen in cinemas – a must-have for Rooster Teeth fanatics! We’re also giving away a Manga goody bag over on Twitter. Simply reply to the below tweet with Lazer Team’s release date to enter! We’ve also appeared in this month’s Mangazette, sharing just how much we love Lazer Team. Check it out here!